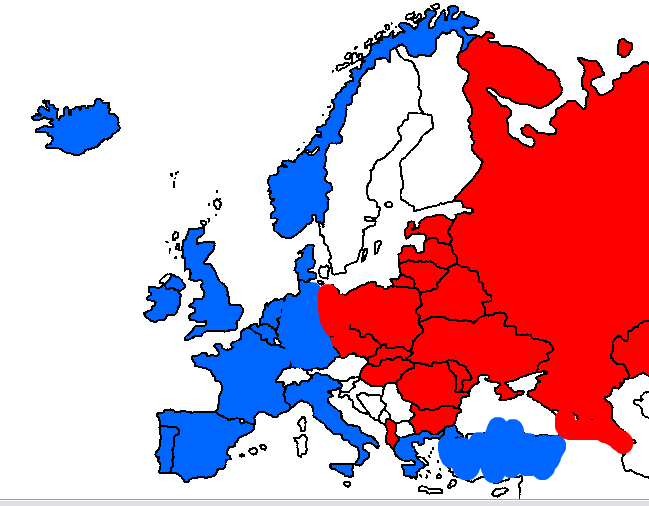 In thinking about Ukraine, I decided to compare Europe in 1984 and 2014. Cold War vs. Post-Cold War. 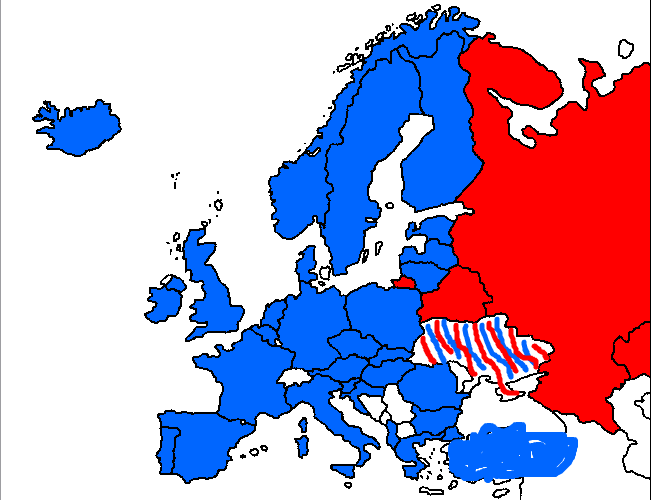 Using a rough mapmaking program, with maps with 2014 borders, I approximated EU/NATO/pro-US (BLUE) and USSR/Russia + allies (RED). One straightforward conclusion: BLUE has swept east. 2. Russia wants a near abroad, a sphere of influence. NATO and EU enlargement have greatly diminished the size of #Russia's sphere. 4. With EU more moderate, is a confrontational, you-will-pay US approach really that scary? Likely to work? 9. There are only a limited number of countries to Russia’s west where this approach would work. Not EU, not #NATO. 12. Given its location, can #Ukraine flourish with ties to east and west rather than as one or other? 14. Take my list with grain(s) of salt. Finis. I saw some people wondering on Twitter why Israel, supposedly a close ally of the United States, is so silent about Russia’s intervention in Crimea. It’s an easy answer: there are no gains to be had by publicly condemning Russia, but plenty of disincentives blocking such a response. Israel is a close ally of the US. But allies perform different functions when necessary. Moscow isn’t going to change its mind if Israel comes out publicly against its actions. Nor will a firm Israeli condemnation bring other states on board; nobody waits to see the Israeli reaction to major events in Eurasia before deciding to follow suit. From Jerusalem’s perspective, there are powerful reasons to avoid open denunciation, and even some things to be afraid of. First, there are fairly strong ethnic ties between Israel’s million-strong Russian minority and the motherland. Foreign Minister Avigdor Lieberman remains, in many ways, a Russian nationalist (though he was born in Moldova), and he has long viewed his role as serving as a bridge between the two countries. Second, Israel doesn’t like unnecessarily alienating Russia on an issue of little strategic importance to it. This is because Israel prefers to maintain an open line to the Kremlin on matters related to Russia’s Middle East policy, particularly arms sales to Israel’s enemies. In the past Israel has sometimes been able to convince Moscow to stop or slow down such sales, but lately it hasn’t had much success. Closing that door entirely makes no sense at this point, especially given that Israel’s security establishment has become concerned with a gathering jihadist storm on its borders. Third, Israeli-Russian trade is important to Israel. They have already begun to negotiate a free trade agreement as part of Israel’s strategy of diversifying its relationships in the world in the face of concerns over European boycotts of the settlements. Fourth, there are some worries in the Israeli government about anti-Semitism in Crimea and Ukraine more broadly. Despite what I said above, Benjamin Netanyahu does keep an eye on developments related to anti-Semitism abroad, and does want to be able to offer whatever protection he can to diaspora Jews. It may be that he has decided not to antagonize Putin in case he decides to call on Russian troops to protect the Jewish communities in the area. This, at the same time that Israel is trying to maintain ties to Ukrainian nationalists and pro-Western elements to expand business links. The Crimean crisis is, then, another example of US-Israeli interests diverging. It should not be surprising, then, that the two see no necessary reasons to coordinate policy or public statements.